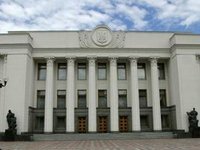 The Verkhovna Rada will demand that the signatories to the Budapest Memorandum guarantee that no weapons will be used against Ukraine, the Ukrainian parliament said in a statement passed on Friday. The Rada has urged the parties who signed the Budapest Memorandum to hold immediate consultations with Ukraine to ease tensions. The Budapest Memorandum signatories must take "practical steps to reaffirm their obligations, enshrined in the Memorandum, according to the principles of the CSCE (Conference on Security and Cooperation in Europe) Final Act, to respect Ukraine's independence, sovereignty and existing borders," the parliamentarians said. The Rada is expecting "confirmation of the obligation to refrain from the threat or use of force against Ukraine's territorial integrity or political independence." The Rada also demanded that Russia "discontinue steps aimed at encroaching on Ukraine's territorial integrity and not to support separatism," it said. In the event of an escalation of the situation Rada will ask the guarantors to seek immediate aid for Ukraine from the United Nations Security Council. "Special missions under the aegis of the OSCE (Organization for Security and Co-operation in Europe) and the Council of Europe are invited to Ukraine to check whether the rights of all the ethnicities and religious faiths in the Autonomous Republic of Crimea and other Ukrainian regions are being properly observed. We suggest that the United Nations Security Council convene a session to consider the aforesaid problems in the context of the UN SC statement of July 20, 1993," the statement said.